Unit fuel costs estimated to be lower by 27%. Fuel comprised 43% of SpiceJet’s operational costs in Q1’15. Fuel price down by 28.4%. Airline carried 17.4% higher passengers per capacity unit. However, total passengers lower by 33.4% when compared to Q1’15. Filled more seats than before. Overall unit operational costs estimated at INR 3.65/seat-km, down ~13% from Q1’15. Unit revenues may have been significantly impacted by poor on-time-performance leading to loss of high-paying last minute time sensitive travellers, stiffer competition, lower market share, weaker network. Airline has more than operationally broken even. Estimated operational profits INR 80 – 110 Crore or lower. Lower finance costs expected due to better negotiations. Net profit may touch around INR 100Cr. OTP needs to improve – worst OTP amongst private airlines in 9 out of 12 months. Shift of focus necessary from financing to cost reduction and revenue maximization. Much has changed for SpiceJet in Q1 FY2016 compared to Q1 FY2015. Q1 of the last financial year witnessed high fuel prices, a weak rupee, redelivery of aircraft to lessors, and increasing competition. Routes were still being rationalised, and SpiceJet was pretty much ‘all over the place’. The airline realised an operating loss of INR 92 crores (against a net loss of INR 124 crore), and the airline cited various factors: “One Time Costs”, “High Fuel Prices”, and ‘General Economic Slowdown”. Fast forward to Q1 FY2016. SpiceJet flew through the quarter on fuel prices that were nearly 30% lower than that in Q1 FY2015. There were no aircraft that required redelivery. In fact, the airline wet-leased three Boeing 737-800s to cater to the peak season, returning the aircraft in the middle of Q1, to be replaced by two aircraft: one of the airline’s dry-leased Boeing 737-900 that was earlier returned to a lessor, and a wet leased CSA Airbus A319. The rupee weakened only slightly, by 6%, against the dollar. Routes were better planned, and aircraft utilisation went up. Hot meal service, which was stopped during the airline’s crisis period, was resumed. The airline also unbundled its seats, charging for every seat option, including the middle seats. 30% lower fuel prices means much to any airline. Had these fuel prices prevailed during Q1 FY2015, SpiceJet would have shaved off INR 219 Cr from its INR 773 Cr fuel bill in Q1’15. An operating loss of INR 92 Cr would have turned into an operating profit of INR 127 Cr. Fuel accounted for 43% of the airline’s operating expense in that period. The low fuel prices, better stability in the fleet, and better negotiated & re-negotiated contracts leave SpiceJet with no excuses for not reporting an operating profit in Q1’2016 – the quarter ending June 30th. The graph below shows what’s changed in Q1’16 compared to Q1’15. Those labelled in green are positive indicators. More passengers (17.4%) have flown for every seat kilometer. Fuel prices were down 28.4%. However, freight suffered. The rupee weakened. Flights were shorter, with both cost and revenue implications. This also signals that a larger portion of the capacity was driven by the Q400s due to a smaller Boeing fleet size. This and shorter stage lengths also reflect in the average speed (Kilometers / Block Hours). SpiceJet had a fuel CASK of about INR 1.82/seat-km in Q1’15. Fuel prices in Q1’16 are down 28.4%, but the airline flew shorter flights, which meant a higher cycle ratio. A higher cycle ratio increases overall fuel burn. With this, fuel cost in Q1’16 is estimated at INR 1.33/seat-km, down 27% per ASK. SpiceJet wet leased on average 2 aircraft in the quarter (3 Boeing 737-800s for the first half and one A319 thereafter). While the airline also added one dry-leased Boeing 737-900 later in the quarter, a portion of the ASKs were generated by the wet leased aircraft. Further, with a higher Q400 capacity to Boeing Capacity (13 active Q400s : 17.5 active Boeings), the dry-lease rentals of the Boeings have been diluted over the deployed capacity. These two factors, and the higher USD are estimated to have costed the airline INR 0.45/seat-km for dry-leases. The ACMI charges, including hourly wages, are estimated to have costed on average INR 0.17/seat-km, when spread across the entire airline’s capacity. Airport charges may have been impacted on account of higher cycle rations, estimated at INR 0.26/seat-km. The higher US dollar and higher cycle ratio may have increased maintenance costs, but maintenance unit costs were diluted by the ACMI lease, resulting in INR 0.45/seat-km. No redelivery costs are expected for this quarter. Other operating costs are estimated at INR 0.12/seat-km. Employee benefits are estimated at INR 0.42-0.44/seat-km, due to salary hikes for crew members to arrest the exodus of pilots by matching remuneration with industry standards. Depreciation & Amortisation cost (Which includes the Q400’s) is a fixed cost, costlier in Q1’16 due to lower deployed capacity. It is estimated at INR 0.11/seat-km. ‘Other expenses’ are a little difficult to estimate, and is questionably estimated at INR 0.33/seat-km based on an averaging method. This brings the total Q1’16 operational CASK to an estimated INR 3.65/seat-km, with a tolerance of about +/- 1.5% (Obtained through 3 separate estimating methods). This is between 12% to 14% lower than the Q1’15 operational CASK of INR 4.20/seat-km. Revenues are harder to estimate when not monitored. In Q1’15, SpiceJet had a domestic market share of 18.8%, which dropped to 11.6% in Q1’16, despite traffic having grown by 22%. Impressively, share fell by only 38% despite a 42% drop in capacity. But a smaller share of a larger market, in the face of increased competition, and reduced capacity does not bode well. Lower fuel prices and increased competition have only led to lowering of airfares on average. Further, the stimulation tactics employed by SpiceJet were copied by other airlines, who have, to arguable degrees of success, implemented SpiceJet’s recipe to drive up unit revenues. Two other factors may lead to lower unit revenues. Poor on-time-performance (OTP) has today made the carrier a lesser (and sometimes the least) preferred option for the high paying, time sensitive traveller. This lowers the pricing power of the airline. Lower cargo uplift per flight (and per ASK) negatively impact ancillary revenue. In Q1’15, a peak season, SpiceJet commanded on average a direct operational revenue of INR 5,015 per passenger. IN Q4’15, a lean season, this had dropped to INR 3,942. (This was also affected by poor capacity in Q4). With the market challenges described above, SpiceJet’s direct operational revenue per passenger will be between these two values. Below are the unit costs and revenues, graphed. Those in grey boxes signal ‘grey areas’. To operationally break even, SpiceJet would have needed a RASK of INR 3.70/seat-km to match the worst case CASK of 3.70/seat-km (3.65+1.5%). With a RASK of 3.70, and an assumed other operating RASK of 0.02, the airline would have needed a direct operational RASK of INR 3.68/seat-km. This translates to a direct operational revenue per passenger of INR 3,974. Since this is almost (+0.8%) the per passenger revenue seen in a lean season Q4’15, and certain in the fact that the Q1’16 per passenger revenues will be higher, we are convinced that the airline has at-least operationally broken even in Q1’16. The next question is how much. For direct revenue per passenger of between INR 4,000 and 5,000, we obtain the RASK, the Profit-ASK (PASK), and the operating profits. While we would love to believe that the airline has realised a high, 3 digit operating profit of between INR 7Cr and INR 268 Cr, lower capacity, higher competition, poor OTP and related poor service perception, and lower cargo are some of the factors that may have adversely impacted revenues and hence RASK. With RASK perhaps lower than Q1’15 (INR 3.96/seat-km), the airline may realise an operational profit of around or less than between INR 80 – 110 Crore (for a CASK between INR 3.70 and 3.60 per seat-km). 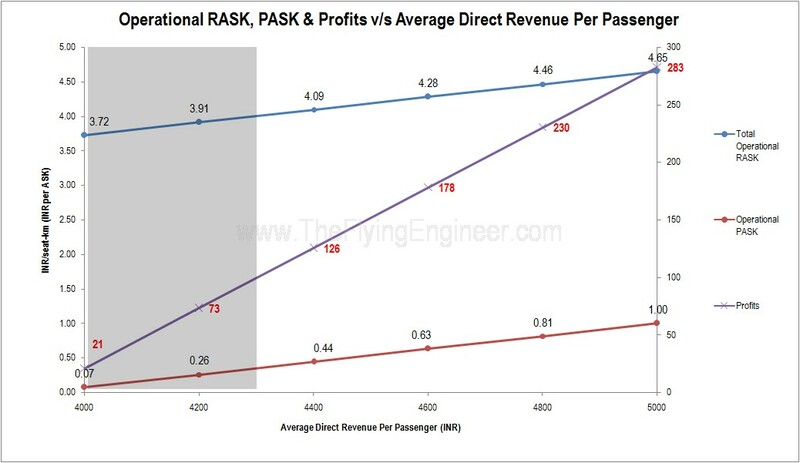 The grey area in the graph below shows the likely region for RASK, PASK (both in INR/seat-km) and profits (in INR Cr). With Ajay Singh’s negotiations working well for the airline, finance costs are expected to be lower in Q1’16, perhaps around or lesser than 25 Cr. Other income, which are from sources other than operations, such as exchange fluctuation gain, provisions no longer required, insurance and warranty claims, manufacturer and lessor incentives, income from training services and the like, may amount to around 20Cr. With a lower finance cost that may be either offset or exceeded by other income (as historically observed), the airline may report a net profit in Q1’16, of close to INR 100Cr. Financial results for Q1’16 are expected to be declared on 28th July 2015. For unit revenues to increase, the airline must focus on its on-time-performance. Customer Gap in the airline is high : SpiceJet is today unfortunately perceived as a brand that will not get you to your destination on time. That gap needs to be addressed, and may take a good six months or more before the perception damage is recovered from. The graph below shows that in the 13 month period June’14 to June’15, SpiceJet had the lowest OTP amongst private airlines for 9 months. The airline presently flies a fleet of three aircraft types and in total four variants: Q400s, Boeing 737-800s, Boeing 737-900s, and one wet leased A319. Since the A319 is an ACMI, there is no significant operational impact to the airline, but may introduce commercial challenges. Ideally however, the airline will need to streamline and standardize to just two aircraft types, including variants. This will make capacity management easier, minimizing disruptions and capacity management challenges. 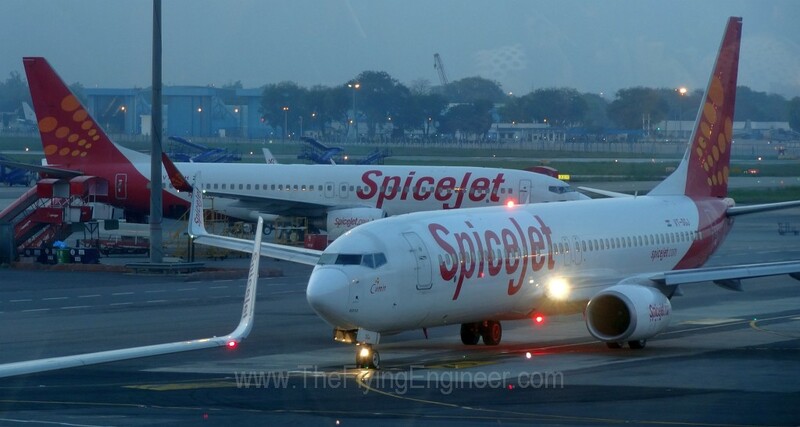 SpiceJet today operates 18 Boeing 737 aircraft, one wet leased A319, and 13 Q400s. The airline flies to 41 destinations : 36 domestic and 5 international. Of the 252 flights operated daily, 230 are domestic, and 22 international. This works out to almost 3 flights out of every destination. Of those 252, 116 are operated by Q400s, and 136 by narrow body jets. The network has contracted: a year ago, the airline flew 362 flights a day connecting 55 destinations. Yet, this is not as consolidated as IndiGo’s, which flies 639 flights connecting 38 destinations: 33 domestic and 5 international. This is almost 8.5 flights per day out of every destination. Of course, the models adopted by both airlines do not allow for a fair comparison, but helps understand the level of consolidation that SpiceJet may eventually need to achieve. Modest profitability in Q1’16 is possible in large due to lower fuel prices. The airline may need to optimize other costs to increase profitability. For the 9 months ending December 31st, IndiGo’s RASK (over two peak and one lean seasons) was INR 3.92/seat-km, while its CASK was INR 3.55/seat-km, allowing it to enjoy an operational PASK of INR 0.37/seat-km. Low costs, economies of scale and the high capacity deployed help IndiGo reap higher profits. To put things in perspective: based on Q1’16 figures, every 1 paise (INR 0.01/seat-km) shaved off unit costs allows IndiGo to save INR 10 crores, while for SpiceJet, this leads to a saving of almost INR 3 crores. With Ajay Singh coming on board, things are slowly getting better. With him trying to increase the valuation of the company, he is out to do what it takes to financially re-piece together the airline. However, a big challenge for SpiceJet is that it today is at a stage that has set it back, closer to the starting line (a lot better than not existing, though). It’s got a heavy and nasty luggage of the past : debt and poor perception, both of which should eventually go away. It is rebuilding itself, which almost pits it against start-up airlines except for the fleet size, network, established brand name, and knowledge of market behaviour. The airline is once again close to the start line, with Ajay doing what it takes to make the airline run faster and attempt to regain lost ground. The focus must shift from financing to lowering costs and maximizing revenue. For that, the airline will need to focus on the basics. Extensively written and superb as usual. Enjoyed the thorough analysis. Wish there were articles like this on every quarter on every airline. Superb article and very meticulous analysis. Thoroughly enjoyed reading this one. Wish there were more articles like this every quarter on every major airline.